We're learning to take advantage of the elusive sunny days in Scotland. They're rare, and few and far between so when the sun shines (even for a couple of hours) we try to get out and take in the Vitamin D.
On a particularly sunny Sunday afternoon a couple of weeks ago, we hopped on the train and rode it to the very end- to Helensburgh Central. Originally, a wealthy resort town, Helensburgh was the perfect place to spend a sunny afternoon. The "Rhu Road" is a pavilion along the waterfront and in the background are Rhu, Rosneath, and Gareloch. I'm not sure just how long the pavilion is, but it's quite lengthy (we walked along all of it) and the views on a sunny day are splendid. We saw several sailboats out and about, probably hailing from the Helensburgh Sailing Club. Views of the marina from the park at the end of the road. 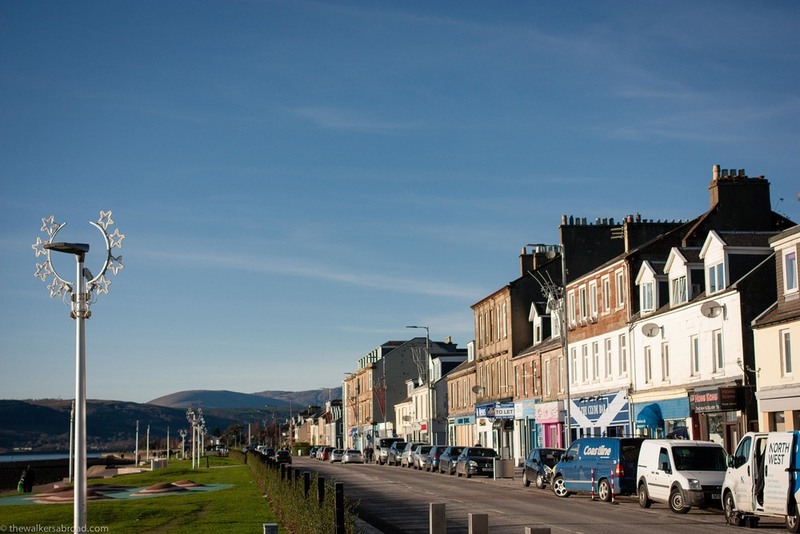 Helensburgh is the second most expensive town in Scotland, in terms of property buying. Its wealthy roots go back to the settling of the town in 1776 by Sir James Colquhoun who built spa baths as a means of making this a seaside resort town. Its location led to many wealthy Glaswegians settling here in the mid 1800s and it was previously known for housing a quarter of British millionaires. Famous residents include Deborah Kerr (known for the King and I), several silver and gold Olympic winners in both the swimming and sailing categories, the authors Neil Munro and J.C. Cronin, and Henry Bell who introduced passenger steam boats to Europe. Overall, Helensburgh was a beautiful, quaint little town. It's popular with day-trippers and it's easy to see why: the beautiful scenery and tiny streets set against dynamic hills are a stunning combination. These tiny Scottish towns are beautiful hidden gems, just slightly off the beaten path, making them perfect get-aways from the more populated cities.